Here are a few of our many references. You will need your sound turned on to listen to the audio references and quotes. Please book an appointment with us to come look at the binders full of testimonials from thousands of satisfied clients. Contact us and start your journey to become our next success story! I just wanted to let you know that your staff did an amazing job for us at our Costco Christmas party! They were very friendly and professional. They entertained our guests without being obnoxious or in your face. I would definitely recommend Sounds Unlimited for those seeking any DJ services. And we will definitely be booking with you again when we figure out when and where we will be having this years Christmas party! Costco - Corporate Holiday Party - January 12, 2013. Just want to thank you for your contribution To our AUPE Local Area Council event. Everyone felt that Mark & Ami did an excellent job ensuring our needs were met and exceeded. Our committee was very much impressed with their ability to entertain us as well as motivate our small group to participate "Out on the floor". Karl Clauss, AUPE Local Area Council - Member Banquet - January 12, 2013. Just want to tell you that WE all had a great time at our party the DJ was great. Had lots of positive feedback. Hope to see you next year. THANKS SO MUCH! Kary Jablonkay - Frito Lay Taber Corporate Holiday Party - January 12, 2013. Just wanted to let you know that I have received tons of compliments about how well the Christmas Party worked out. Everyone said it was the best one they had been to for a long time. Interestingly, many people were sad to see your guys pack up after the “ Name that Tune” segment. They wanted music and they wanted to dance. So I would like to talk to you about booking for next year and adding on that extra portion for the DJ’s to play some music afterwards! BFC Management Ltd. - Corporate Holiday Party - December 15, 2012. I want to send a huge thank you to you guys for such a great job. Chris and Keith kept the party moving all night and continually impressed me on how they were able to handle such a vast difference in age groups and involve everyone so much. They did such a fantastic job, I seen people dancing that I had never seen get on the dance floor in the four years I have been doing Neu Lite's parties. We got several compliments that it was the best party yet. Thanks again and really looking forward to working more with you guys in the future Cheers! NeuLiite Electrical Corporate Holiday Party - December 14, 2012. Hi Cary, thank you! We certainly enjoy working with you - thank you very much for all your help! Everyone had a blast this year and many comments on the lighting and the selection of music. Great job! Let’s go with the same package again next year. Thanks! Charlton & Hill Corporate Holiday Party - December 14, 2012. Just wanted to say everybody got involved and had a blast at the party. Minute to Win it is a FANTASTIC game to play!! Thanks for providing this for us. The Lethbridge Brick Corporate Holiday Party - December 09, 2012. I just wanted to let you know that the two Sounds Unlimited reps you sent to the party were Awesome. Once it was time for them to take over they owned the microphone and the floor. We had an email sent Monday morning from the GM saying this was one of the better xmas parties in a long time. So once again thank you and I am sure you will hear from us again in the future. Dan Landriault - MPE Corporate Holiday Party - December 08, 2012. Just a short note to let you know what a great evening was had by all at the Lodge on Saturday night. Your staff did a real swell job of entertaining, an evening we’ll talk about for a while. We here at LFS hope you and your staff have a safe and wonderful holiday season!! Thank you for a great party. Linda Emerson, Lethbridge Family Services Corporate Holiday Party - December 08, 2012. Just wanted to touch base with you after our event. Our group had SUCH a good time with your crew. It was a TON of fun. Certainly kept all who attended entertained! Maureen Boone - Chatters Medicine Hat - Corporate Holiday Party - December 08, 2012. We were so pleased with the professionalism of Sounds Unlimited Inc. at our recent school dance. The entire process was easy right from the first time we contacted Cary for pricing details. The DJs were professional and FUN. Parents that attended the school dance were raving about the interactive style of the DJs who were not afraid to lead the kids (and parents) in a few dances. We will definitely be booking our next dance with Sounds Unlimited!!! I just wanted to thank you for providing the best two D J's ever!! I say that with no exaggeration, not only did they get every one up on the dance floor but they accommodated every one of my requests including dressing up in costume to fit my vintage themed wedding. I would recommend that anyone looking for a DJ fo any event should STOP LOOKING because there is no one better! On September 1, 2012 we were married in Lethbridge Alberta and it wasn't even a question as to whether or not to select Sounds Unlimited Inc. to be our wedding reception enterainment. Even though we heard countless raving reviews prior to our wedding, we could have never imaged the level of service and commitment to fufilling our every wish. From the onset, Cary Kish met with us to run through what we as a couple envisioned our reception to be and to take the time to get to know personally. This played a key role at our wedding reception since everything was so personalized to us as a couple. Following that first meeting to book Sounds Unlimited for our reception, we recevied ongoing wedding tips and reminders which was a tremendouns help to keep us on track until the big day. Then the big event. Sounds Unlimited Inc. was able to offer unique lighting effects that transformed our venue into a fairytail. The uplighting we selected emphasised and highlighted our decor perfectly. I would highly recommend getting the personalized monogram lighting as it made for some amazing unforgettable photos. The thing that stood out to us the most was the fact that Cary had our guests dancing until the lights came on! We got so many compliments from guests commenting on how they have never attended a wedding where they have seen the dance floor so active throughout the whole night, credit must go to Cary Kish and his amazing staff for this. 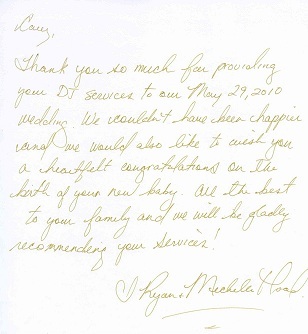 Cary made us feel so calm, relaxed and taken care of throughout our entire reception. There is no entertainment in Lethbridge that could remotely compare to the service and satisfaction you will receive from Sounds Unlimited Inc. We received a level of service that went above and beyond what we could have ever imaged. Thank you Cary Kish and your team to contibuting to a fabulous and unforgettable day! All was great, thanks! All my requests were played & Kevin read the crowd well & kept the party going. Everyone had a ton of fun. Thanks!! 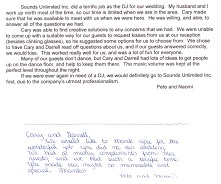 Thank you Sounds Unlimited for providing an excellent, professional, but FUN atmosphere for our wedding reception. After having a bad experience with our previous DJ, it was a great relief to work with a company who knows what they're doing through every aspect of the planning process! THANK YOU DARRELL!! Your moves are great, and the guests loved it :) Thank you, thank you, thank you! Our decision to work with Sounds Unlimited for our wedding entertainment was one of the best choices that we made throughout the process. Right from the very first meeting a great deal of stress had been alleviated when we realized exactly how much Cary and his team would be bringing to the table. We quickly realized that Sounds Unlimited does a lot more than simply play music...they worked tirelessly to support the planning process, co-hosted the evening, and ensured that our vision became a reality. In addition to working closely with us and providing the convenient online planning program, they also took the time to meet with and support our Master of Ceremony. Cary provided fun ideas for the evening that we hadn't thought of and clearly were a hit with our guests. In addition, the music that was played throughout the evening was fantastic. They read our crowd well and always had people up dancing. This was the busiest dance floor that I've seen at a wedding in a very long time! 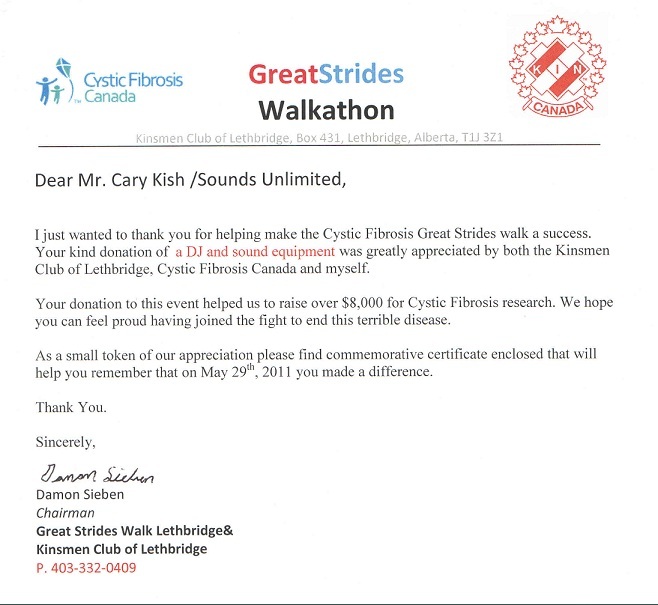 Thank you Cary, Brandon, and the rest of the Sounds Unlimited Team. Sheri Richardson & Ryan Thomas - Wedding - July 14, 2012. The music selection that Sounds Unlimited played at my wedding was perfect for our families - they were dancing all night! The volume was perfect, you could have a conversation with people and dance. It was a great balance. They helped make the night transitions smooth and were helpful and considerate. They lived up to all their promises! I would hire them to do ANY event I might host in the future. They were fun from the beginning to the end. They have a lot of unique ideas and help you carry out any of your ideas too. 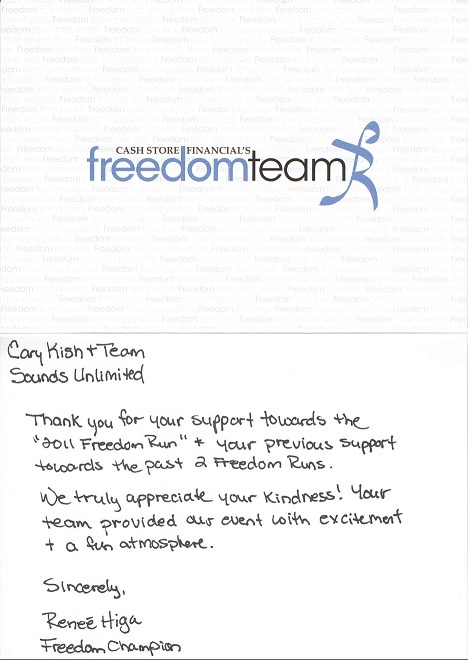 Sounds Unlimited was a great company to deal with they gave us everything we wanted and more. We had so much fun and the our guests also had fun as well. 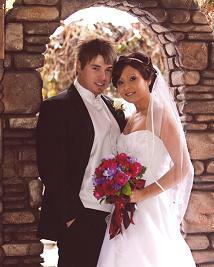 Jenny Lee & Andrew Pohl - Wedding - June 23, 2012. I just wanted to say thank you to you and your team for making our wedding so amazing. The deejays were great and the music was awesome. We appreciate all you did. Thank you!! Leslie Cornelsen & Justin Egger - Wedding- June 16, 2012. We had such an amazing day and your DJs played a large part of that. From the music and microphones at the outdoor ceremony, to the perfect selection at the reception, we could not have asked for a better experience. Your DJs really took the time to understand what we wanted, and the kind of people we are. Keith and Sean were great from the first time we met, right up until the last dances!! I would definitely recommend your services to anyone who is looking for a fun experience! We wanted the guests at our wedding to enjoy themselves and dance all night long, and that is definitely what we got! We also had music and microphones provided for our outdoor ceremony, and it was better than I could have hoped. We had some older guests, and they were very happy to have a lapel microphone so that they could hear our vows without a hand held microphone taking our attention. 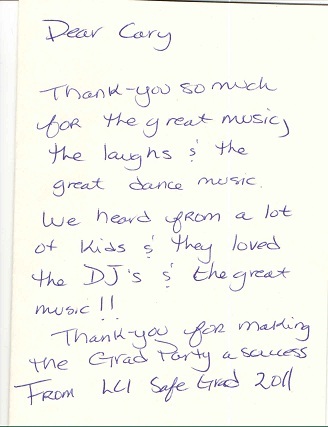 The DJs thought of everything and the music was a great addition to our wonderful ceremony. Thank you so much to Sounds Unlimited Inc for helping us have such a great day! Definitely something we will never forget!! Nicole Martin & Jordan Williams - Wedding - May 19, 2012. We have used Sounds Unlimited for our Christmas Party and Tax Party and have had nothing but the best DJ and music experience. The DJs are very accommodating and play great music - the dance floor was packed well into the night and Sounds Unlimited was the talk of our office on Monday morning for what a great job they did. They do more than just play music - they are able to entertain which ensures that everyone has a great time. Thanks to everyone at Sounds Unlimited for helping make our parties so enjoyable! 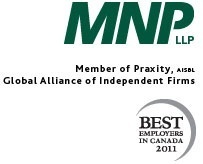 Corporate Holiday & Tax Parties, March & December - 2011. Corporate Holiday Party - November 20, 2011. 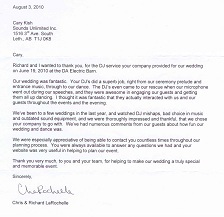 We were very impressed with the professionalism of both the company and the DJ's. They helped us out so much with the planning of our wedding and they made everyone feel comfortable during the wedding. Also very impressed with both DJ's who were very friendly and didn't steamroll us when we had trouble making a decision or were unsure of what to do. The suggestions they provided as well were welcome and they treated us with the utmost respect. What is your favorite memory that your DJ played a part in, from your event? : The DJs playing the music that got everyone up and dancing! Sarita Kempe & Calvin Tams - Wedding - November 05, 2011. We just got back from the honeymoon and wanted to say thanks so much for doing such an amazing job for our wedding!! We had a lot of compliments on the music even after just the ceremony! You went above and beyond when you gathered all the bridesmaids once it was time to start the ceremony and helped get us started on time. I along with the guests really appreciated that. I have to say that I have never seen so many people dance at a wedding and I know it was because of you guys. There was always people on the dance floor and the game we played was so much fun! And there were no party poopers… no one was in a seat when that game ended. We and all our guests loved our Love Story. It was really great. Funny and yet romantic. A very unique touch. People were asking us if we wrote that and had you read it and we said nope! We answered a few questions and you wrote the magic. People were asking us all night long who our dj was. I can’t thank you enough for suggesting the uplighting to add to our evening. It made such a difference! The room absolutely glowed and had such a romantic, fun feeling. It was perfect. Thank you for not only being the best DJ but a great Master of Ceremonies. I really did have the night of my life. Kim Carlson & Derek Grimes - Wedding - October 08, 2011. Sounds Unlimited did a fantastic job!! We couldn't have asked for a better DJ service. The price was great and the service was amazing!! The dance floor was always packed and people are still telling us what a great time they had and how much they liked the music. We also got our names on the wall with our wedding date and had hearts on the dance floor. It just made it that much more perfect. Meeting with them for our timeline was easy on the request page was great. We got to have the songs we wanted and made sure the songs we didn't want weren't played. Thanks again guys you did a GREAT job!!!! Stephanie Bier & Matt Rilkoff - Wedding - September 10, 2011. Mark and Darrell were AMAZING!! We were super impressed! Neither family is what you would call the "party" type, yet there they all were dancing up a storm!! Incredible! The lighting looked amazing as well! We can't thank you enough for your DJ services! We would absolutely recommend you to anyone looking for a DJ! Thanks so much!! Kelsey Reed & Tyler Boras - Wedding - September 04, 2011. I could not believe how amazing Sounds Unlimited made our wedding. We upgraded to get the up lighting and I could not believe the difference it made!!! Literally night and day!! It really helped focus the room to our head table and just give the whole space the feel we were wanting. They were very attentive and were constantly asking us how we were liking things and if we wanted them to do anything different. They really helped make our day a great day. They were able to make really great suggestions and keep us organized. They really make it your day and not just another wedding. I would hire them again in a second for any other occasion!! Paige Hughes & Brent Dykslag - Wedding - September 02, 2011. Sounds Unlimited Inc. was great, I would definately recommmend to friends and family. The planning process is detailed and they work with you to come up with the perfect playlist. They listened to what we had to say and honoured our do not play list. The staff is friendly, helpful and have amazing personalities. They made our reception very special!! Megan Kidd & Alex McLeod - Wedding - August 27, 2011. Thank you for the fantastic evening and for all you did to help attribute to our wonderful wedding. You and Drew were so helpful both in the planning stage and throughout the actual wedding day. Our guests had so many compliments for the job you did, from pumping up the crowd for our entrance, name that tune for table selection and the LOVE STORY was a huge hit. Thank you for telling us to trust you and do it… people absolutely loved it. I would also like to thank you for your professional yet entertaining attitudes. You were able to ensure people had a great time, yet you followed a schedule and were very attentive in following the noise bylaws we were faced with. You two contributed greatly to our night and kept our guest dancing until the end. I would also like to thank you for the uplighting. I was nervous about it and was unable to see it before our guests arrived but it was absolutely beautiful! It added so much to the atmosphere of the room and really brought our color them e to a whole new level. Especially since our venue was very white, it was such a beautiful touch. Thank you for everything!! We would be more than willing to make recommendations for you to all of our family and friends. In fact, I think my sister may be contacting you about her wedding next summer! Once again you were great, Thank you! Kelsey Noyes & Dawson Christie - Wedding - August 20, 2011. Sounds Unlimited Inc. went above and beyond my expectations. In hind-sight, I would have taken more advantage of their skills. They weren't just DJ's and music, they were hosts, MC's and entertainers. People at my wedding actually thought Cary was a family friend and not just a hired professional. I think we almost shyed away from the cost. Was the cost of these two DJ's a little high? At first glance it was, but after interviewing with others who were more affordable, they did not offer the same diversity in music or the same professionalism. Every e-mail I sent was answered within minutes and with specific information pertaining to our ideals. Sounds Unlimited Inc. stepped up with more ideas for us and our guests than we had going into the evening and the whole night my guests felt like they were part of our day and I the sound and music was great, the dancing was awesome. They gave me and Lance time to mingle with our guests, checking with us before making announcements for garter tosses and cake cuttings. I can't tell you in words how much more amazing they made it and how close they made us feel from the first e-mail until the 1:30 am on the big night! Their organization of time lines and equipment and working so closely with our venue and keeping any stress and frustration off of us, I would hire them again in a heart-beat! If I was putting together another event, of any kind. I would call these guys again! Alyssa Knelsen & Lance Skoog - Wedding - July 16, 2011. All our guests were very impressed. I got lots of comments on how fun our wedding dance was! The service and professionalism was awesome. Thank you so much! You were excellent and helpful in pre-planning and coordinating our wedding. The level of service we recieved exceeded the money we spent - great value! "I just wanted to pass on a note too Thank you and your staff for a great time on Friday night, there are comments such as "The best tax party ever" floating around the office this week!!" Cole & Daina Lazarotto, Dream Come True Wedding Reception, June 19, 2010. Dave & Danni Bechdholdt, Dream Come True Wedding Reception, August 02, 2009. Melissa & Troy Mangone, Dream Come True Wedding Reception, May 30, 2009. "In all my experiences with Sounds Unlimited Inc I have always been extremely happy with the service that is provided. When planning an event there are always things to worry about and when it comes to the music I know as long as I have you guys at the wheel there is nothing I need to worry about. It sure makes my life a bit easier." Daina Lazzarotto, HR Administrator, McCain Foods. 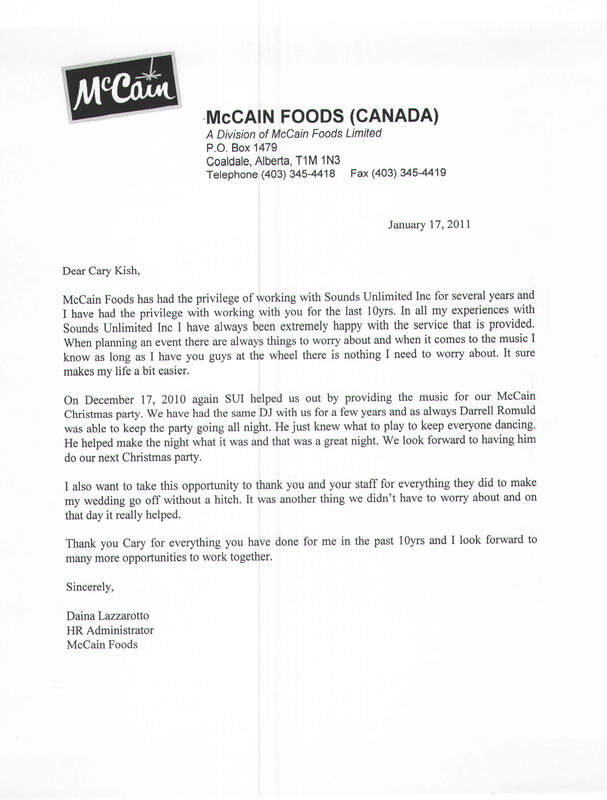 Click on the McCain Logo to read Daina's entire letter. "We have hired Sounds Unlimited for our school dances for well over a decade and have been very pleased with their service. They are reliable, and willing to help in whatever way they can to make your dance or function a success. From specialty songs, to help from the D.J. with the running of activities during the dance, they are always accomodating. The biggest reason we have stayed with Sounds Unlimited is that they relate to middle school students and always have an incredible selection of music from old to new. Whatever you want they can provide." Sandra Krchnak, D.A. Ferguson Middle School, Taber, Alberta. "Our last dance was great! Your staff were wonderful to work with and very professional." Terry Grahn, Brooks Junior High School, Brooks, Alberta. "Kevin & Josh were great. We had many positive comments after." Janene & Kieran Ward - Traditional Wedding Dance, August 07, 2010. 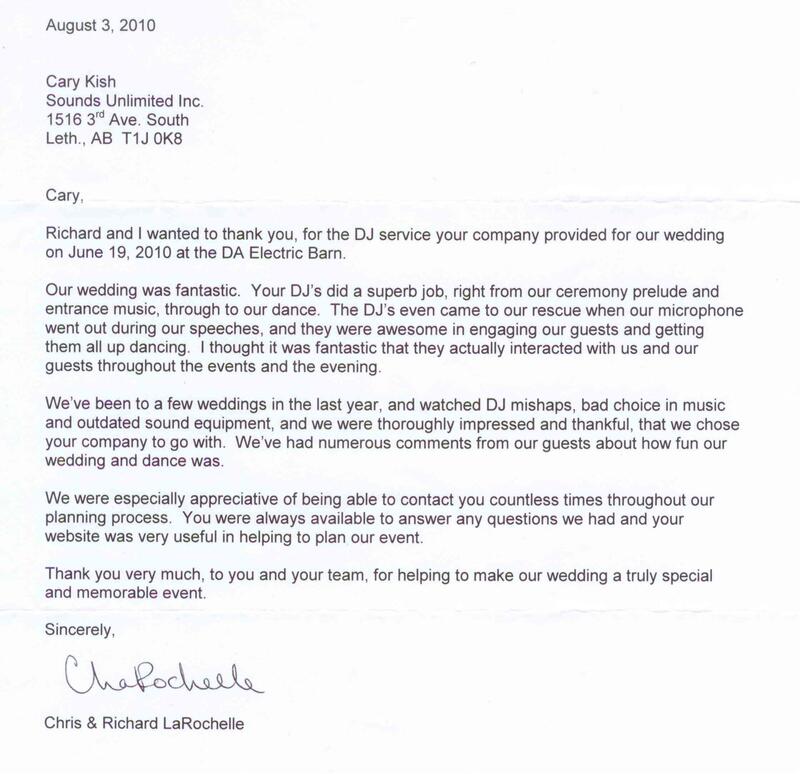 "Thank you so much for providing your DJ services... we will be gladly recommending your services!" Ryan & Michelle Hood - Dream Come True Wedding, May 29, 2010. Click on the letter to the right to enlarge it in a new window and read all of Ryan & Michelle's comments. "Both of the DJ's did an awesome job! They really seemed to pay attention to what music brought people out to dance and kept playing more like it!" Kimberly Van Ham - Dream Come True Wedding, July 24, 2010. 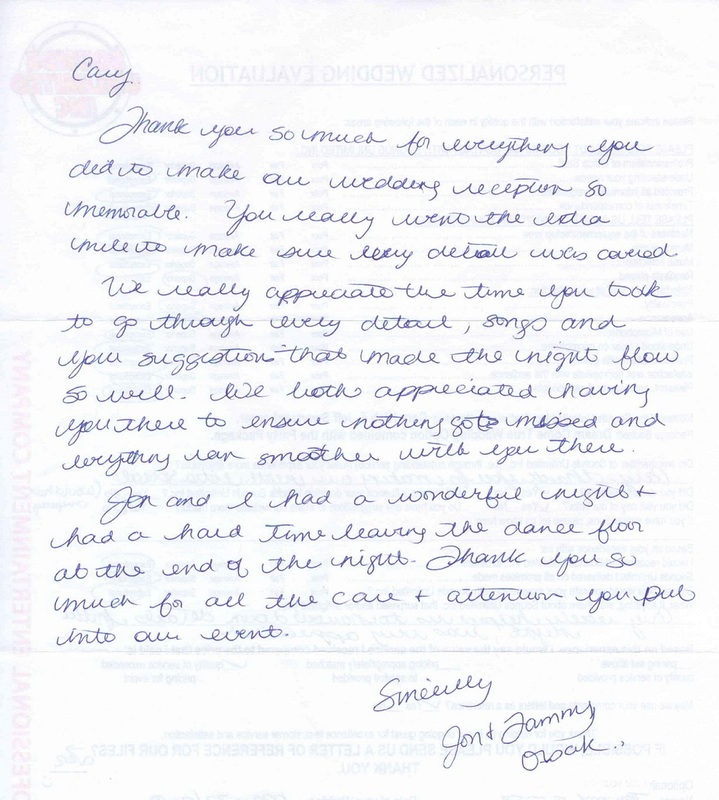 "Jon and I had a wonderful night and had a hard time leaving the dance floor at the end of the night. 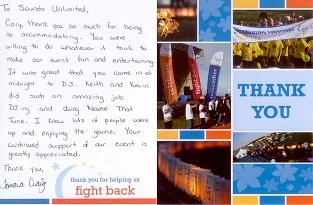 Thank you so much for all the care and attention you put into our event." Jon & Tammy Orsak - Dream Come True Wedding, May 22, 2010. Click on the letter to the right to enlarge it in a new window and read all of Jon & Tammy's comments. 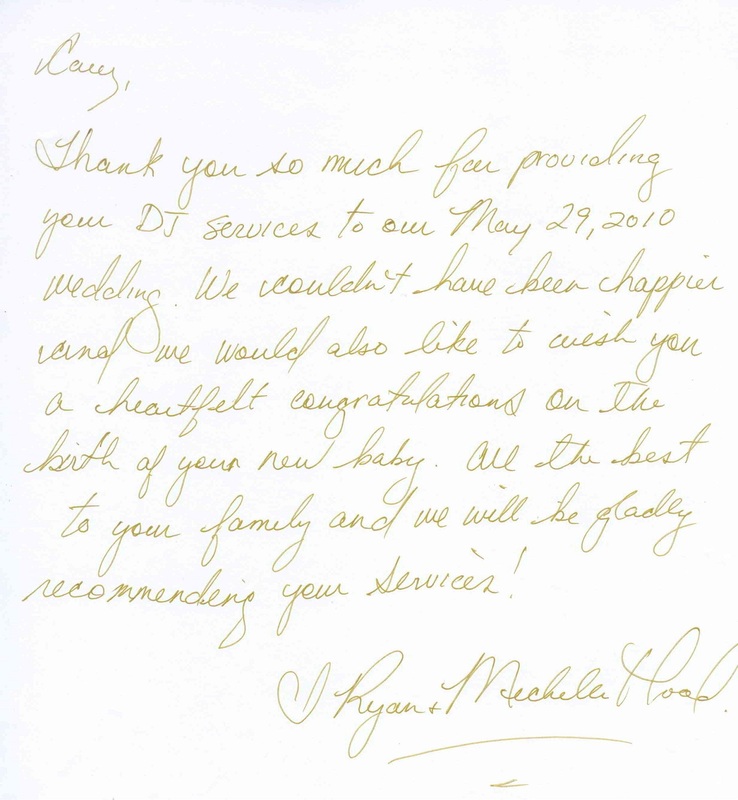 "Both Darrell and Sean were very good and made our wedding a blast. They played our requests, joined in the fun and made our day perfect!" Justin & Kayla Schooten - Traditional Wedding Dance, June 25, 2010. "We've been to a few weddings in the last year, and watched DJ mishaps, bad choice in music and outdated sound equipment, and we were thoroughly impressed and thankful that we chose your company to go with." Chris & Richard Larochelle - Dream Come True Wedding, June 19, 2010. Click on the letter to the right to read all of Chris & Richard's comments! "We were a bit ill prepared, yet Both Kevin & Dallin showed exceptional skill and were able to flawlessly execute the evening and went the extra mile to make our night perfect!" Eric & Alena Matlock - Dream Come True Wedding, July 10, 2010. 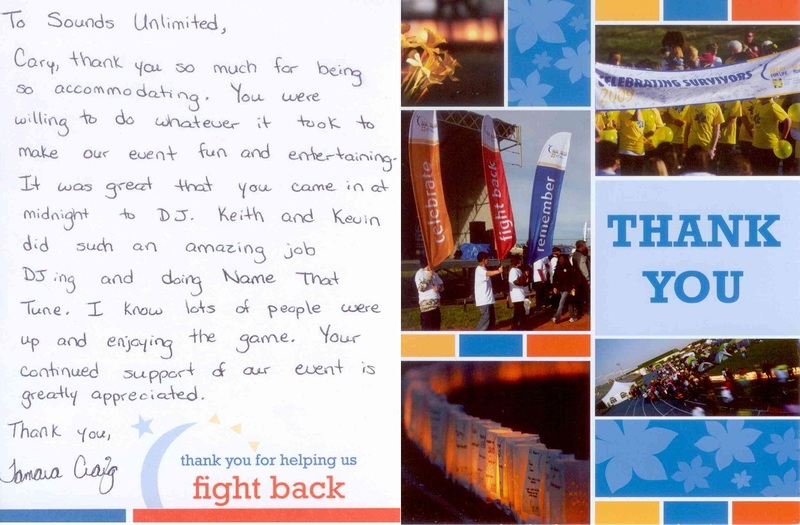 "You were willing to do whatever it took to make our event fun and entertaining." Click on the Thank You card to open it in a new window large enough to read. I just wanted to finally get around to thanking you for hosting such a fun night for our group on July 23rd. You did such a good job engaging everyone and encouraging involvement---it was so great to see every table up dancing or moving around including the little ones and the 80 year olds! I heard comments for the rest of the weekend about how great a night that was, what a fun activity that got everyone mixing right from the start and that we should do this type activity at future reunions etc. Several specifically made mention to me how great you were---how positive and energized you were and clearly knew how to read the room or get people up and moving! It takes a special kind of talent to do that. Thanks so much Cary for making our evening so special and it definately set a positive and connected tone for the rest of our great weekend reunion. 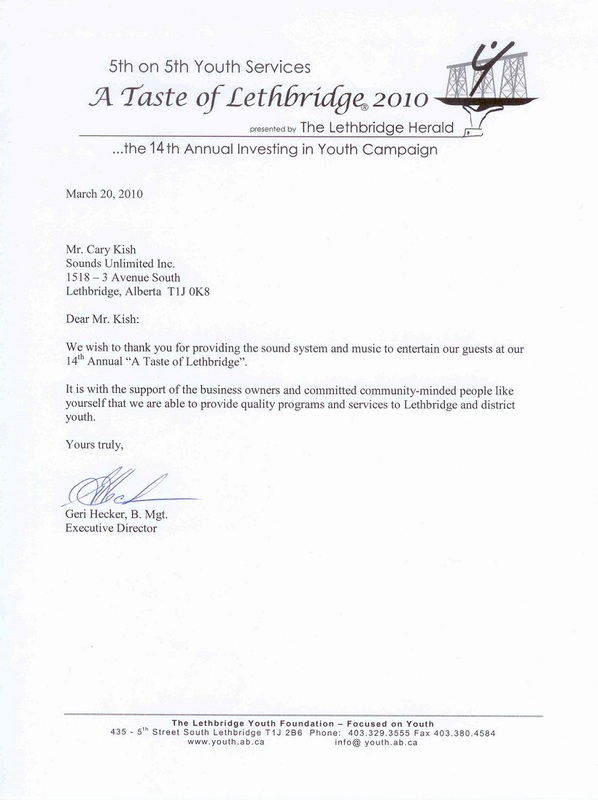 "It is with the support of the business owners and committed community-minded people like yourself that we are able to provide quality programs and services to Lethbridge and District youth." Click on either of the documents to enlarge and see them in detail. and make any funchtion a great time." Click on the logo to the right to read all of the comments sent in after thier event. We just wanted to say thanks for the awesome job you guys did at our staff Christmas party on December 4th. The MC was excellent and got everyone involved. The restaurant manager was very impressed and has asked for your contact information so I will pass it along to her. We would definitely recommend your company to others. Thanks again and Happy Holidays. I cannot begin to tell you what a great time was had at this year’s Christmas Party. I have never received so much praise and thanks as I have this year. I have typed up a letter of thanks. (click on the Charlton & Hill Logo to read the letter) As well, I would like to go ahead and book with y’all for next year’s party! Click on this logo to read the whole letter! Johnathan Kayne, top 5 contestant on Season 3 of the hit Bravo TV series Project Runway. 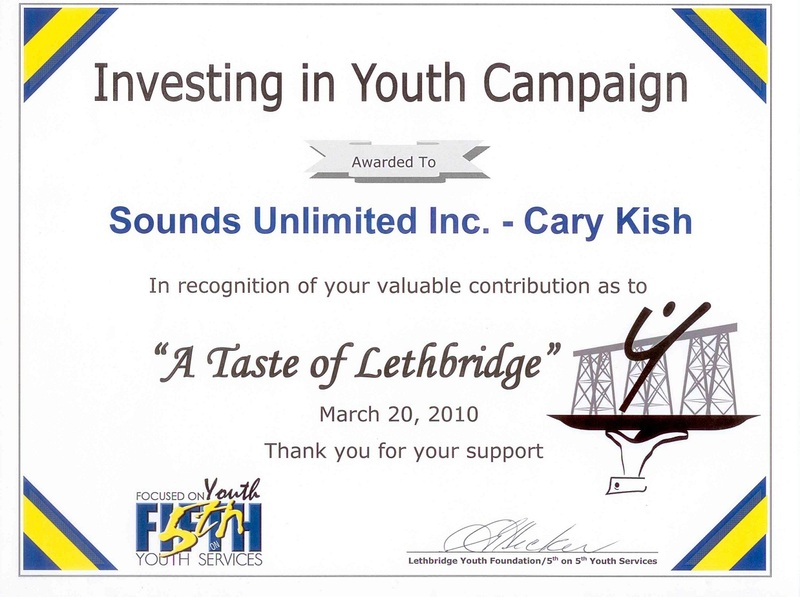 Sounds Unlimited Inc. did the music, sound and lighting for his fashion shows in Lethbridge. Click on the picture to the right to read Johnathan's comments. Click on the play button to hear what Candice had to say on Monday after her wedding. Read Candice's comments by clicking on the image of the letter below. Click on the play button to hear what Dean had to say on Monday after his wedding. 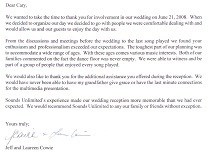 "We would recommed using Sounds Unlimited Inc. for any function. You will be glad you did!" Click on the logo to read the entire letter Ron Angyel from Triple M Housing sent us. "Besides being very reliable and fun, your staff is completely focused on customer service. You deliver what you promise!" 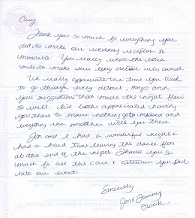 Click on the logo to the right and read the entire letter Barbara Brown from Finning sent us. Click on the thumbnail image to the right and read the letter. Click on the thumbnail to the right to read the reference letter.